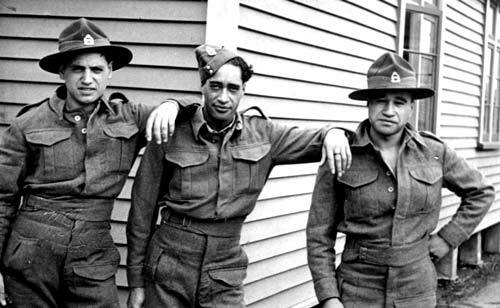 Hone Tuwhare (right) joined the 16th Māori Battalion reinforcements towards the end of the Second World War. He is seen here at Trentham with his friend Johnny Dixon (centre) and another soldier in 1945. The war ended before Tuwhare could be sent overseas, but he subsequently joined Jayforce (New Zealand troops that served as part of the occupation force in Japan).